After a fire, many times the focus is on the devastation and destruction caused by the fire itself. But what many people don’t realize is that the smoke and soot residues left behind after a fire will continue to cause damage, and that much of that damage can be prevented with prompt action. 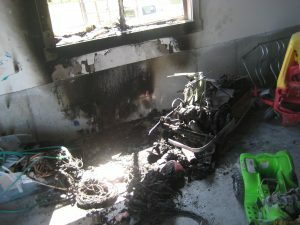 Smoke and soot can damage your home and your belongings. They can also cause odors that linger for years, so when it comes to repairing fire damage, you can trust Clean Masters to get your property and your life back in shape. Clean Masters technicians are professionally trained to save your valuable possessions by removing smoke odor, soot, and residue. Specializing in deodorization and smoke/soot removal, our qualified, trained technicians use state-of-the-art equipment to remove smoke odors from your home or office. Smoke’s odor causing particles are removed from carpet, walls, ceilings, and floors. When you choose Clean Masters, you can rest assured that you have selected the right people to do the job. Years of experience in returning homes and offices back to normal and helping families and individuals just like you make Clean Masters the best choice for smoke damage repairs. Whether you need emergency damage control or restoration services for your home or business, Clean Masters is there for you. When your home has suffered from smoke damage, contact Clean Masters! We are known for our consistency, speed, and high standards of customer service. Our goal is to restore your property as quickly and efficiently as possible. We will also work with your insurance company to help expedite the process!